My wife and I recently decided to use President’s Weekend to visit Florida again and – since I have a mid-Winter break as a teacher – I am continuing on to Nashville for the rest of the week. We used a variety of different mileage deals as well as knowledge of where to get discounts in order to book these tickets. 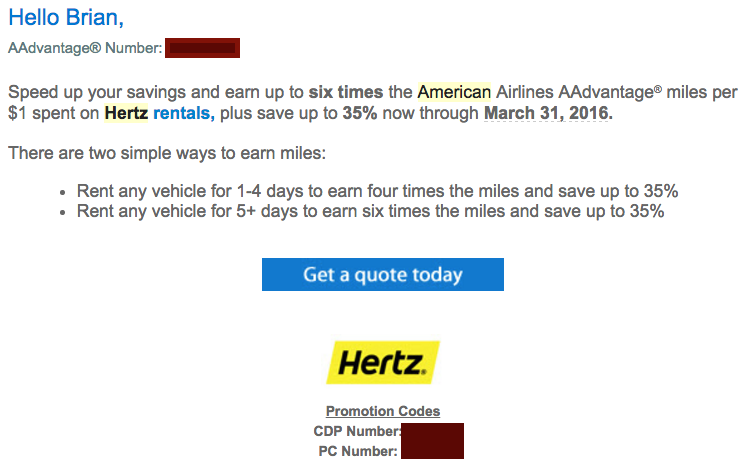 I don’t often use these deals, but I received a notice in my email from American Airlines that we could earn 6 times the normal mileage for renting through Hertz using certain codes sent to me via email. That’s exactly what we did, so for total cost of under $200, we got our three day rental. Total cost: $197. This is the cheapest part. My parents have a condo in Delray Beach. If you have family members who have places to stay in Florida, take advantage of it. Instead of spending any hotel points or money to stay in an AirBnB or something like that, it was free. Total cost: $0. My wife is returning to New York on February 16 and I am continuing on to Nashville to explore a city and state I’ve never been to! I found a return ticket for her using United because we received travel vouchers for $150 due to our complaint a few weeks ago on our last trip to Toronto. I found a deal for $211.10 (pretty good) on her return fare. We have the MileagePlus Explorer card, so baggage is free for the first two travelers. Total for her flight: $211.10 – $150 = $61.10. As I mentioned, I am continuing travel to Nashville for three more days of relaxing break. I found a deal with Southwest Airlines for a direct flight using a ridiculously small amount of points: 6,699 for the one-way. Since we have more than enough Chase Ultimate Rewards points right now, I transferred 5,000 (I already had about 1,900 in my account) and booked the ticket. Total cost: $5.60 (Sept. 11th fee again). I did some searching using the various hotel points we have and found a good deal with Hilton Hotels for a Hampton Inn at the Grand Ole Opry in Nashville. For only 30,000 points/night I could book my three nights for free! The only snag was that I only had 80K. I researched the cost of the extra 10K points and found out it would have been another $100 to buy the points necessary. Instead, I looked at some of the transferable options that I have access to. I shied away from using our Chase Ultimate Rewards point as we want to use that for a return flight for our honeymoon. Instead, I realized that I have had a few thousand Citibank ThankYou points lying around a checking account for years. I looked at their list of transfer partners and – low and behold – Hilton is one of them! At a ratio of 1.5:1, I transferred 7K for a redemption of 10.5K – exactly what I needed. Total cost for my hotel: $0.